I'd like to see picas as a choice for document units. Not having the most common type of design measurement is a bit of a bug really. Oh, Kip. It's only a bug if it were available but didn't work in some fashion. Is not being able to have greater than 2 pages in a horizontal spread like in ID a bug also? As it turns out according to Serif Picas were not included since it's and outdated measurement that no one uses anymore . Because math is the kind of thing that goes out of date. Remember when I wrote those threads arguing that even when Publisher would come out it wouldn't be even close to taking on the pro competition in this area? Yeah, stuff like this. Also this is something Quark does from the main interface (without needing to dig into the preferences) as it should be. 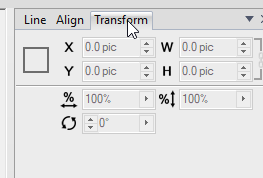 I don't think even ID works this way (I'm still on CS6.) Publisher should work this way as well. 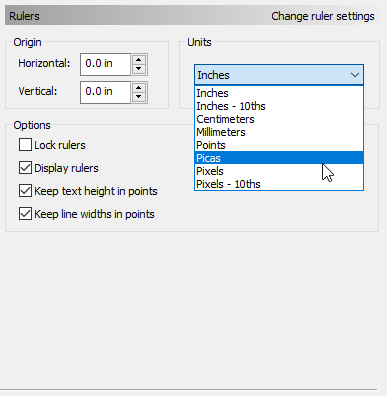 Click on the ruler to change both the x and the y a the same time. Basic function done at least a gazillion times a day. I think I've probably used picas more than I can count on my fingers and toes, but not much more. Which would be such a small fraction of the number of publications I've made or worked on the word insignificant comes to mind. In fact, I've only used picas when working on a publication someone else has created and they will be getting it back. But it's never been my choice of measurement. But for those for whom picas are a be all of measurement, it should be easy enough for Serif to add. Whether or not someone uses the measurement is separate from if it is the most efficient or best way to work. A lot of people shoot video vertically or use the word "literally" incorrectly but I am less concerned about the number of people who do these things then how sound their reasoning is for doing them. Yep, that's me. Mr. Inn Efficient. Maybe it's time to change my tag below my name. But then again, maybe Idiot in Training is still apropos. 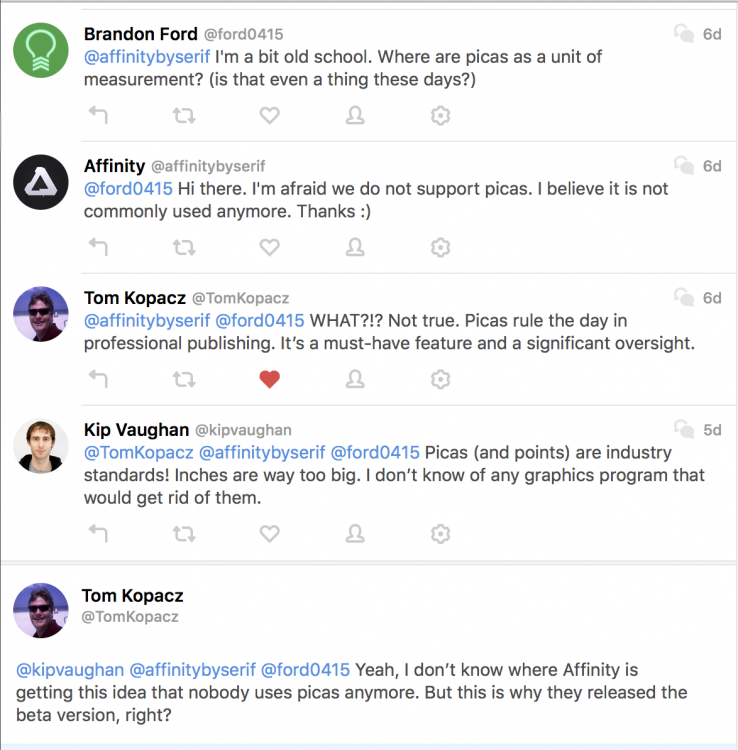 Look, I didn't call the time honored practice among those who use picas dinosaurs or inefficient or not the best way of using that measurement. In fact, I mentioned that it should be easy enough for Serif to add it. I guess I did try to inject a bit of humor and failed miserably. But what do you really expect from an inefficient idiot? I am mostly concerned that Serif doesn't seem to understand the reasoning behind it given that they apparently are made up of people who work in the field. Still not sure if the company is really serious about thinking the measurement is out date or it's just a joke I am not getting? I dunno about the if it is a joke part or not. Is there a thread or was it private messaging? So once upon a time in Serif land it was possible. Yes, it was said in a thread. Anyway I have made a request last week for this lack of support to be reconsidered. I guess picas support should be added to please our american friends. It was actually a conversation from Twitter a week ago by whoever runs the Twitter account. Here is a good video showing several examples on how the units convert. You can see that points and sometimes Picas are nice even numbers where with inches you need to deal with fractions which makes things unnecessarily complex. Looks like points converts nicely to pixels too but I wonder if 72dpi is still relevant in the age of high res monitors? 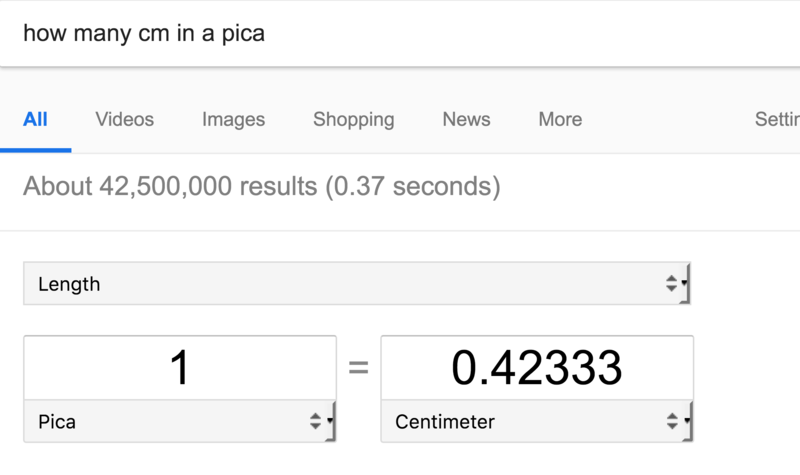 Sorry, but picas and points are not an entirely﻿ different system like inches﻿! cm and mm are not compatible with picas. Points are subdivisions of Picas so don't need to deal with the complexity of needing to convert to different systems. Very compatible. They all can describe lengths. Seems you have forgotten that inches, picas and points play in the same league. In the same way that you get complex fractions when converting inches trying to fit mm or cm into a Picas give you these numbers with long uneven decimal points. Using points gives you a pretty even 12 points per pica. 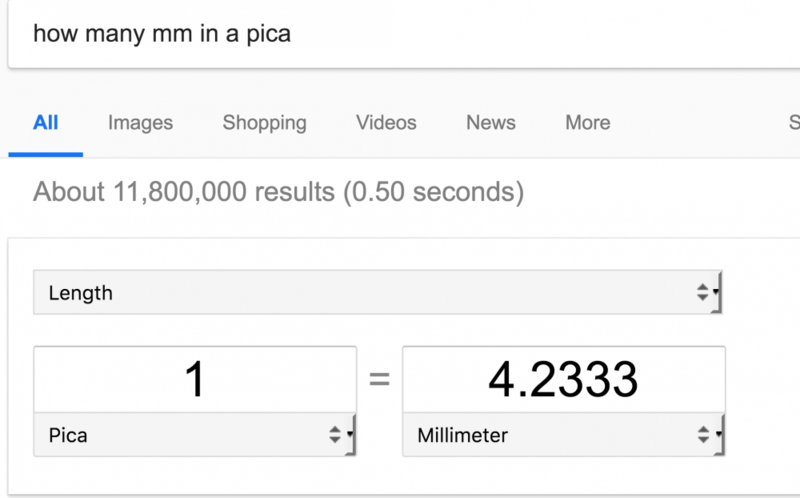 The metric world probably doesn't have much use for Picas/Points, so as more of the world turns to metric, the US may have become rather isolated in the continued use of this unit of measurement. As Serif is based in the UK (I think? ), they may well be working with people who are quite experienced in the field, but who are all using metric and thus don't realize the continued importance of this measurement within the US. But Serif does support points which is a subdivision of picas. It's absurd to just support half of a system. It's like doing all of your finances in cents and doing away with dollars. We still need dollars since buying expensive items would be too difficult if you had to buy your next house or car only using cents. We need both dollars and cents. We need both points and picas. As a bookbinder in the US, I prefer metric over inches/feet as it is the most efficient and quicker measurement for fine binding of books. As a typographer, metric does not cut it - NOR does inches/feet. Points/Picas describe font measurement in Europe and US. In fact, Didot a French type designer from the 1700s was the first to establish the point/pica system to produce some of the finest typographic families in the world. For type, it is the most efficient and quickest measurement whether in the US or Europe. It is not just an "American" system and it is not an outdated system. It is a system with a specific purpose and it should be included for any designer concerned with accuracy paired with expedience. A lot of the things I have mentioned here are taught in high school level graphic design programs. They are certainly taught in college 101 classes. I took typography/design classes in the early 2000s and just took them this year. They are still hammering this measurement as the one to use in this field.